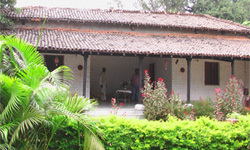 J Farm was built in 1900 as a granary for the Maharaja's paddy fields in Girhola, one of the hundreds of agricultural plots of the state. It was usually put in charge of the village headman as the royal officials from Kanker would visit only once in a while. Sometimes, if the villagers were lucky, the Maharaja would camp here en route to hunting in the nearby jungles of Badbhum. On these occasions, the Farm would come alive with festivity. Since independence, it has reverted to us and has now been opened to visitors as part of our attempt to give our guests an authentic feel of the life of our region. Earlier called 'Raja Dhaba' or the king's barn, it is now called J Farm after the nick names of Jolly and Jai, your hosts, who often personally supervise cultivation in the fields. Jolly is greatly devoted to the welfare of village as well and is loved by the village folk as a friend and benefactor. 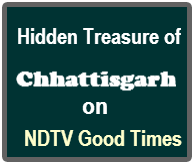 The main structure is in the traditional Chhattisgarh style with mud walls, tiled roof and a pillared verandah. The building on the side is recent but maintains the rhythms of the older structure. Since the older building functioned as a granary, its layout can be properly understood only if this is remembered. Please ask your hosts to show you the grain lofts and the ventilators meant to air the stock. Since the intention is to give you a sense of time and of the rural, the facilities at J Farm, though modern, have been embedded in the site as naturally as possible. Please bear with us if there are slight inconveniences. Our suggestion would be that you relax in this idyll, look out towards the fields yonder and note the sounds and smells of a bucolic atmosphere as the sun sets behind the hills. There are several short trips you could make from J Farm. Within a range of 2 to 25 kms on good roads, you can visit a beedi (tendu leaf cigarette) factory at Charama, a temple and waterfall at Siyadai, three serene reservoirs; and go boating and bird-watching in the backwaters of the river Mahanadi at Paur. All these together make a wonderful package for sight-seeing and adventure. Or else you could stroll into the village or trek a short distance into the forest, or even better, do some angling at our own small pond in the front of the farm! We hope you enjoy your stay at J Farm. Kanker Palace now offers one of its farm houses as a hide away just so that you could relax and enjoy the beautiful country side. 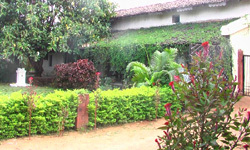 The Farm is equipped with western toilets and well furnished rooms. Sometimes, on a long and tiring tour, one feels like taking a day off and just letting go. Kanker Palace now offers one of its farmhouses as a hideaway just so that you could relax. 30 Kms into the countryside at Girhola, where a farmhouse is set amidst lawns and is surrounded by paddy fields, you get to unwind in rural idyll. Here you could visit friendly villagers and look into the eyes of cows and buffaloes, or read, write, paint or cast a line in the pond. You could also see the sun set beyond the hills at a distance and hear a lone hyena call out into the dark, as you enjoy a barbecue dinner! A short drive from Girhola are the serene and secluded backwaters of the Gangrel reservoir on the Mahanadi. Canoe – like boats will glide you into a landscape where small, grassy islands play hide and seek within a placid expanse of water, a place that, not surprisingly, has become a haven for both local and migratory birds like the Cotton teal, the Brahmi duck and the Open-billed stork. After your time at Girhola you will come back refreshed for the rest of the tour and a memory that will make you smile.